Sony has expanded its new E-Reader family with the highly-anticipated wireless Reader Daily Edition, which features 7-inch wide touch screen display (portrait or landscape orientation) with 16 levels of grayscale, attractive aluminum body with built-in cover for durability, and free wireless 3G connectivity to give users an access to Sony’s eBook store via (US) AT&T’s 3G mobile broadband network. According to Sony, around 30-35 lines of text are visible in the portrait mode, to make the experience very similar to that of a printed paperback book, just as what you see in the photo. 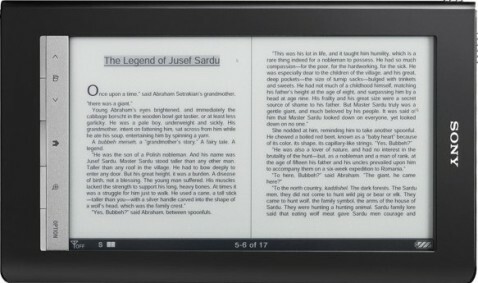 In addition, Sony Reader Daily Edition also boasts enough internal memory to hold more than 1,000 standard eBooks, plus memory expansion slot aimed for holding even more eBooks. The new Sony Reader Daily Edition that incorporates Sony’s award-winning industrial design and E Ink Vizplex electronic paper display will hit the market in December 2009 for $399.